Blend up your very own yogurt smoothie recipe! Try a yummy strawberry yogurt smoothie. Or you can add any type of fruit to your yogurt smoothies. Pick any flavor from these different yogurt smoothie recipes! While I was working at the smoothie bar... I realized that yogurt smoothies were one of the favorites of the customers. You can make a yogurt smoothie any flavor with whatever fruit you wish. Whenever possible buy organic or from a local farmer who lovingly cares for their animals. You might be surprised with the high quality yogurt that you will receive from cows that have been naturally raised. You can save a lot of money by making your own yogurt. You can also make dairy-free yogurt with coconut cream, almond milk, etc as the base. You can use many different types of natural sweeteners (agave, coconut palm sugar, honey, etc). Also, I usually need to add agar agar to thicken it up to a yogurt consistency. But if you need to buy it, make sure to purchase plain & cultured yogurt. Many flavored yogurts are full of sugar, juice concentrates, and syrups. 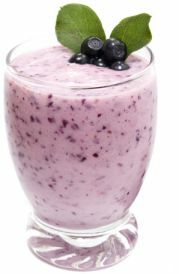 You can create healthy yogurt smoothies by using your own low calorie sweeteners, like stevia or xylitol. When you buy yogurt with cultures, it is beneficial bacteria that make a home in your intestines. Several alternative health experts say that having a gut full of healthy bacteria will create a strong immune system and regular bowels. Unfortunately, we kill off our good bacteria by taking antibiotics and even by drinking sodas. We must replenish good bacteria throughout our diet or by taking probiotics. You can also eat other fermented foods like sauerkraut. To save money, you can buy the bigger tubs. If you are looking to make a lot of yogurt smoothies, never buy the 6-8 oz sizes. They really add up in cost. If the cost of organic yogurt is a problem for you, you can buy bulk organic yogurt from a co-op at a cheaper price. Get together with a couple other families that want yogurt also. Then... everyone saves money! When I just bought my yogurt this week, I saw that the organic 32 oz version was only 50 cents more than the cheap store brand! I can afford to pay 50 cents more for better quality yogurt. Or... like I said above... you can make your own. I hope that you enjoy your yogurt smoothies!